PARIS — After two weeks of negotiations at the United Nations COP21 global-warming summit, governments and dictatorships from around the world agreed to a massive deal to shackle the planet in the name of saving it. Among other goals, the pseudo-treaty aims to restructure the global economy, completely phase out cheap and abundant energy sources over the coming decades, redistribute the wealth of Western taxpayers to Third World regimes, and empower the UN to oversee a planetary “climate” regime. Imaging themselves to be Masters of the Universe despite the failure of every single UN “climate” model, the parties to the agreement even purported to decide that global temperatures would not rise above two degrees Celsius over pre-industrial levels. Under the guise of saving humanity from the “gas of life,” as scientists refer to the beneficial gas carbon dioxide, the new international agreement purports to require comprehensive monitoring and tracking of CO2 emissions across the Western world. Over the coming years and decades, the UN agreement also purports to mandate radical reductions in those emissions, essentially shackling humanity — and especially the world’s poor — in order to allegedly “save” it. To reduce man’s CO2 “footprint,” governments also vowed to funnel huge amounts of wealth into expensive and unreliable so-called “green” energy (think Solyndra). It was not clear whether human breath, also made up of CO2, would need to be monitored, regulated, reported, and reduced as well. All combined human emissions of CO2, though, represent a fraction of one percent of all the greenhouse gases present naturally in the atmosphere, with water vapor alone making up some 95 percent. Still, throughout the UN summit and the final agreement, the gas of life has been hysterically and inaccurately demonized as “carbon pollution” and “global-warming pollution” that will allegedly destroy the planet, kill the polar bears, doom mankind, and produce virtually any other horror you could imagine — and some that you could not. But according a wide range of prominent scientists from around the world interviewed by The New American in Paris, the planet is currently “starving” for more carbon dioxide, a gas that is essential to all life, helps “green” the Earth, and provides numerous benefits to oceans. “If you talk to most scientists, they will acknowledge that carbon dioxide is not a pollutant,” explained Dr. Robert Carter, former chief of the School of Earth Sciences at James Cook University. “Indeed, it’s grotesque to call it a pollutant. It’s an abuse of logic, it’s an abuse of language, and it’s an abuse of science…. Carbon dioxide is literally the stuff of life.” Numerous other experts echoed those sentiments. Despite the facts, though, governments and dictatorships at the UN summit proceeded to adopt an agreement that has as its underlying assumption the discredited theory that man’s miniscule emissions of the gas of life — a gas emitted by literally every human activity, including breathing — threaten the planet with dangerous warming and must be eliminated. And with that false premise in mind, they sealed a far-reaching deal attacking CO2 and promising to redistribute massive amounts of wealth from freer and more prosperous societies to Third World despots and regimes that have kept their people in poverty. According to the agreement, by 2020, there must be $100 billion per year in climate reparations from Western taxpayers to foreign regimes, with the number increasing after that. No doubt the world’s dictators were pleased, having previously issued demands for trillions in “climate” loot from the West. Of course, the UN and its member regimes — “Paris-ites,” as critics are calling them — did not get everything they wanted in the deal, allowing both sides to claim partial victory. Instead, the “Paris agreement” operates under a system in which governments and dictators make pledges — emissions reductions, handouts to cronies, central-planning of economic activity, jihad against fossil fuels, keeping people poor, and more — that will be enforced by national governments and overseen by the UN. Every few years, the deal calls for the UN and governments to re-asses their pledges, known as “Intended Nationally Determined Contributions” (INDCs) in UN-speak, to ratchet up the coercive controls down the line. That approach to the machinations was crucial, because, as everybody at the UN summit was well aware, the U.S. Constitution requires that any sort of global treaty be properly ratified by the U.S. Senate. (And even then, Washington, D.C., cannot grant itself new unconstitutional powers, such as regulating the gas of life, by adopting a treaty). As U.S. lawmakers have already made clear, Senate ratification is simply not going to happen. And so, Obama vowed to impose the pledges he made in Paris on the American people using unconstitutional decrees — EPA regulations, executive orders, new federal “standards,” and other lawless mandates. All of those unconstitutional schemes will have to be funded by Congress, currently controlled by the Republican Party. Even under Democrat control, though, the schemes Obama has pledged did not get through Congress. The UN, Obama, and climate alarmists have twisted themselves into pretzels trying to obfuscate the facts. First, Obama claimed the UN agreement would not be a treaty, and therefore would be non-binding and would not require Senate ratification. Then, alarmists tried to claim “treaty” has different meanings in the United States and in what they call “international law.” Finally, when those lies flopped, the new false narrative is that, because the U.S. Senate ratified a UN scheme in 1992, anything Obama, the UN, and the UN’s member regimes agree to is automatically ratified by the U.S. Senate and as such, binding on the American people. That is, of course, beyond absurd. Senate Majority Leader Mitch McConnell (R-Ky.), meanwhile, slammed the pact and its agenda as “unattainable” and said it may go up in smoke. “The President is making promises he can’t keep, writing checks he can’t cash, and stepping over the middle class to take credit for an ‘agreement’ that is subject to being shredded in 13 months,” McConnell said in a statement after the deal was announced on December 12. The GOP-controlled House of Representatives, of course, will have to decide whether or not to fund Obama’s climate antics and the UN deal. And with just 40 percent of Americans even believing in the man-made global-warming theory underpinning it all, according to a Pew survey released last year, public support for the deal is likely to be isolated to the fringe of the fringe of the U.S. Left. “In the face of an unprecedented challenge, you have demonstrated unprecedented leadership,” continued the UN chief, speaking to governments, on the stage at the COP21 summit. “You have worked collaboratively to achieve something that no one nation could achieve alone. This is a resounding success for multilateralism.” Speaking to representatives of governments and dictatorships, Ban said: “Billions of people are relying on your wisdom. The time has come to acknowledge that national interests are best served by acting in the global interest…. We have to do as science dictates.” Perhaps if he had attended the counter-COP21 summits featuring a broad range of top scientists from around the world, he would know better. While global polls and surveys consistently show that alleged man-made global-warming is the least important issue to people worldwide, Ban claimed falsely to have been listening to “people” — especially the world’s poorest and most vulnerable. “They seek protection from the perils of a warming planet, and the opportunity to live in a safer, more bountiful world,” Ban claimed, omitting the fact that the planet has not warmed in 19 years, and that what those people really need is liberty and abundant energy, both of which are now further out of reach thanks to the UN deal. 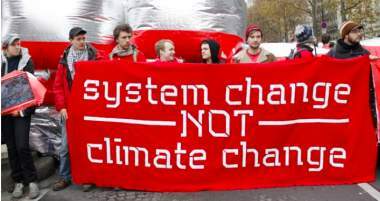 “They have demanded that world leaders act to safeguard their well-being and that of generations to come.” It is true that tax-funded rent-a-mobs dishonestly calling themselves “Non-Governmental Organizations,” or NGOs, were demanding a UN climate regime, but again, in the real world, alleged man-made climate change is essentially a non-issue. The new “climate” regime will aim to replace the defunct 1997 UN Kyoto Protocol, which essentially went nowhere after the U.S. Senate refused to ratify it and other governments backed out. Like Kyoto, the new UN deal does not require much from Third World governments, and it claims that Western taxpayers must finance whatever those regimes do decide to undertake. “The deal is further proof, if any was needed, that the developing world will not agree to any legally binding caps, never mind reductions of their CO2 emissions,” said Dr Benny Peiser with the skeptic Global Warming Policy Foundation. Policymakers and global-warming alarmists, though, are hoping to use the Paris deal as a stepping stone to even more radical machinations down the line. “We are one earth and one human family, and this is a step forward in responding to the climate crisis [sic],” claimed GreenFaith Executive Director Fletcher Harper in a press release sent to journalists at the summit. “We must build on this foundation and be as ambitious as humanly possible to protect the vulnerable and our common home.” Big Business, Big Government, and Big Green all agreed. Other alarmists were touting the agreement as the beginning of the end of the “fossil-fuel era,” referring to the energy supplies that enabled man-kind to create the civilization and prosperity that is today taken for granted in the West. Most of them have claimed that there will be a “transition” to so-called “renewable energy” such as wind and solar — even though these sources have proven to be unreliable and outlandishly expensive, have relied on tax funding, and must have traditional energy sources as a back-up for when the sun does not shine or the wind does not blow. Billions in taxpayer-funded subsidies have been wasted on such schemes, including, for example, the now-infamous Solyndra scam that enriched Obama cronies before going bankrupt, taking $500 million in taxpayer funds with it.